Ford Powerstroke Diesel Forum > Ford 03-07 6.0L Powerstroke Forums > 6.0L Problems Forum > Is this balljoint ruined (see picture)? 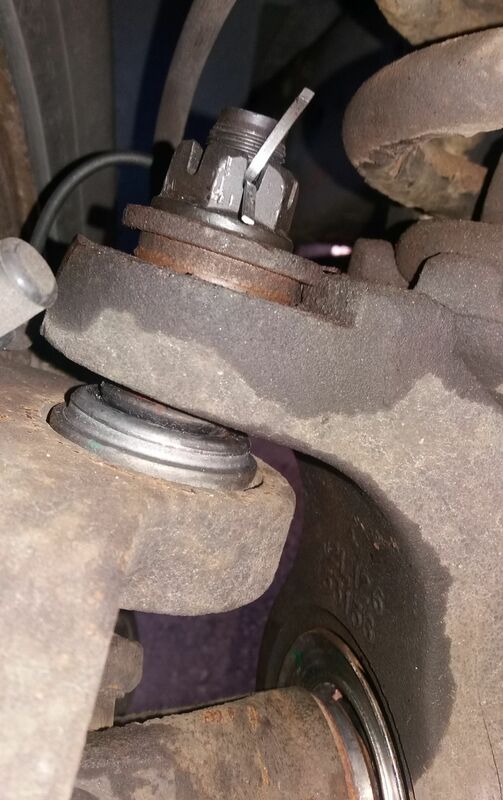 Is this balljoint ruined (see picture)? So took the truck last Friday to have upper and lower balljoints installed on one side by the dealer (covered under my Ford ESP Plan - other side was properly done last year). Then took it 2 days later to get aligned, alignment guy came to me and asked who did the install because the one isn't installed all the way! Spoke to the dealer on Monday morning and am bringing it back tomorrow (Friday). So I'm wondering if putting ~140 miles on the truck with it like this would have messed up anything with either of the balljoints or anything else? The service advisor said it should be fine to drive it, just want to see what others think. Dealer said they did an alignment then the alignment shop aligned it and their 'before' showed it was out of alignment....so wonder who's machine isn't accurate? Just noticed the date. Sorry for the lateness. Forgive my ignorance, but the one thing I noticed was, Where’s the boot for the joint”. If there is suppose to be one, looks like it should by the groove on the base for a boot, then you were driving around with a joint open to all the dust, dirt and road grime. I’d push for a new joint!! Hopefully, everything worked out OK.
Go to first new post Water pump failure?